Rested and recovered after yesterday’s lay-day, the Masters sailors returned to the water with an on-time start and steady southwest breeze that built to 12 knots during the two scheduled races (Race 7 and Race 8) on Day 4 of racing. The top three spots in the Apprentice fleet remain stable, with the two leaders – Scott Leith (NZL) and Jon Emmett (GBR) – trading 1-2 finishes. Ian Gregory remains in third, but had to use a double-digit finish today as his discard, and will have trouble catching the two leaders during the next two race days. Carlos Eduardo Wanderley (BRA) still holds the lead in the Master division, but Richard Blakey (NZL) moved closer with 1-3 finishes today, trailing by only five points. Alessio Marinelli (ITA) remains in third, but is only 4 points out of second. The order could easily change. Grand Masters is the largest division, with 49 boats. Vanessa Dudley (AUS) remains in the lead, but Jeff Loosemore, also representing Australia, closed the gap to four points. Luis Castro (BRA) moved into third with 1-4 finishes today. Michael Kinnear (GBR) continued his march up the latter in the Great Grand Master division with a first and a second in today’s races, moving up to second and trailing Robert Lowndes (AUS) by only three points. William Symes (USA) dropped to third, but is only trailing by a point. Likewise, there is tight racing in the 75+ division. Kerry Waraker (AUS) remains at the top, now leading Peter Seidenberg (USA) by one point. 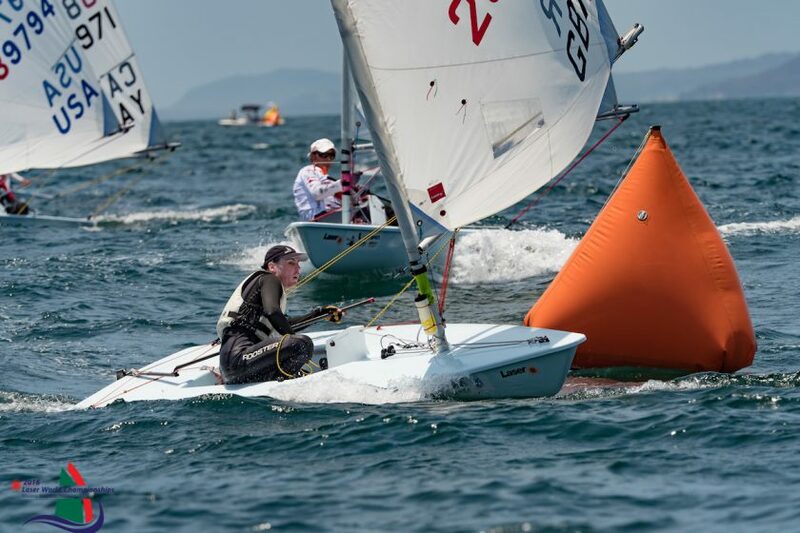 Both have had only top-three finishes throughout the regatta David Hartman (USA) remains in third.